Defending 6A champion Blue Valley North will travel to top seed Gardner-Edgerton with a state semifinal appearance on the line. The Mustangs have things rolling, having won seven straight games since consecutive losses to Bishop Miege, Blue Valley, and Pittsburg to open the season. Meanwhile, Gardner-Edgerton will try and continue an incredible turnaround that has seen the Blazers go from losing 10 straight games to winning 10 in a row. Blue Valley North began to get things rolling once quarterback Graham Mertz returned from injury. Mertz, the Wisconsin commit, has completed nearly 63 percent of his passes for 2,850 yards and 38 touchdowns on the season. Mertz’s top target is senior Cameron Burt who is putting together a historic season in terms of receiving statistics. Burt has an incredible 79 catches for 1,407 yards and 17 touchdowns on the season. The Kansas Sports Hall of Fame lists the 11-man, single-season receiving records as 98 catches, 1,548 yards, and 23 touchdowns. Mertz may have a chance at surpassing a couple of those depending on the Mustangs’ advancement. In addition, Amauri Pesek-Hickson has added 788 rushing yards and six touchdown, and 44 catches for 725 receiving yards and 13 more scores. While much of Blue Valley North’s offense is generated through the air by Mertz’s right arm, Gardner-Edgerton’s success is predicated on a strong offensive line and a three-headed rushing attack. The Blazers have averaged 394 yards per game on the ground and have three players with more than 1,100 rushing yards. Senior back Luke Jennings leads the team with 1,198 yards and 11 touchdowns, while fullback Jacob Hunsperger has contributed 1,115 yards and 11 more scores. Junior quarterback Teven McKelvey has rushed for 1,157 yards and 23 touchdowns on the season thanks to last week’s huge performance in the win over Shawnee Mission Northwest. 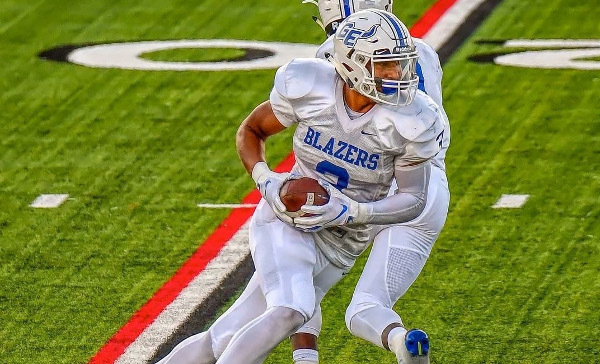 McKelvey carried 26 times for 255 yards and six touchdowns, and added a 33-yard touchdown pass to have a hand in seven Trailblazer touchdowns in the game. McKelvey has passed for 389 yards and five touchdowns this season, but the Blazers have put the ball in the air on less than seven percent of their offensive snaps this season. On the defensive side, one of Gardner-Edgerton’s top linebackers, senior Darin Robertson, won a state title as a starter at Blue Valley North last season. It’s November football and the expected cold weather conditions could favor Gardner-Edgerton’s ground-oriented attack. However, it’s difficult to pick against the determination of Mertz, who we believe will one day be remembered as one of the top quarterbacks in Kansas high school history. A pair of Sunflower League rivals will meet in the other quarterfinal matchup as Olathe North will take on Shawnee Mission East at the Shawnee Mission North District Stadium. The Eagles and Lancers met back in Week 6 of the regular season with Shawnee Mission East pulling out a 35-28 victory in a great game. In the first meeting, Shawnee Mission East used a goal-line stand and an ensuing 99-yard time-consuming drive to beat Olathe North 35-28. The game was tied at 28 in the fourth quarter when the Lancer defense stuffed Olathe North at the 1-yard line. Shawnee Mission East then went on an incredible 18-play, 99-yard drive that resulted in a 1-yard sneak from quarterback Andy Maddox with 20 seconds remaining to give the Lancers a seven-point 35-28. Olathe North answered with a long pass play from Arland Bruce, IV to Devin Stocker to the Lancer 12-yard line to set up time for one final play. That play was a fade pass from Bruce to Eagle running back Daymonn Sanchez that fell just out of his reach incomplete. In the past two weeks, Shawnee Mission East has rolled to a 45-0 shutout win over KC Harmon, then last week forced five turnovers to get by Olathe East, 23-20. Their challenge will once again be to slow down the running duo of Olathe North’s Bruce and Sanchez. Sanchez has rushed for 1,917 yards and 27 touchdowns this season on 203 carries. He’s averaged 192 of the Eagles 354 rushing yards per game. Bruce has added 1,141 rushing yards and 17 scores, while passing for 1,009 more yards and 11 touchdowns. Stoker remains the Eagles’ top receiver with 19 catches for 285 yards and five touchdowns. This should be another great game between two of the top teams in the Sunflower League and the state. Shawnee Mission East’s defense and its propensity to turn opponents over may be the difference in a close game. This is just the second all-time meeting between the schools, according to Kansas Football History. Derby defeated Topeka High, 52-21, in the 2015 playoffs. The contest matches up the two highest scoring offenses in 6A. Topeka is No. 1 with 493 points, while Derby is at 492. However, Derby is easily No. 1 in scoring defense with 74 points permitted against the No. 9 SOS in the 32-team classification. Topeka High has allowed 225 points versus the No. 24 SOS. Topeka has had trouble in Week 10 contests the last several years. Since 2013, Topeka is 8-2, 7-3, 8-2, 5-4 and 8-2 with four losses in Week 10. However, the Trojans earned an impressive 56-21 win against Washburn Rural last week, the second victory this year against the Junior Blues. Jacqez Barksdale rushed seven times for 214 yards and three scores. Standout running back Ky Thomas has enjoyed another massive year with 156 carries for 1,570 yards and 21 scores. Barksdale has 99 rushes for 1,294 yards and 22 TDs. Quarterback Da’Vonshai Harden has 1,429 yards of total offense. Topeka’s only loss came in OT to Manhattan, 21-20, in Week 2. The Trojans lost the game when Thomas was controversially ruled to have been stopped short on a game-ending 2-point conversion. Since 1973, Topeka High’s best finish is the four quarterfinal showings in ’83, ’97, ’12 and this year. Derby is the defending 6A runner-up and has three titles in the last five seasons. Quarterback Hunter Igo and running back Tre Washington have led the offense. For the majority of the season, Derby has challenged the state record for fewest rushing yards allowed in a year. Last week, Derby defeated Dodge City, 54-7, as Igo had 281 yards of total offense and four scores accounted for. Overall, Igo has accounted for 25 scores. Washington has rushed for 1,321 yards, and Isaac Keener has 20 tackles for loss. Both teams are tied for second in 6A scoring defense with 115 points allowed. Free State has a slight edge with scoring offense with 460 points, 33 more than Manhattan. The teams have played virtually the exact same strength of schedule. Manhattan has great historical success with two championships and five runner-up finishes, but the Indians have its best recent advancement since a quarterfinal showing since 2013. Free State has never won a championship with a runner-up in 2008 and semifinal finishes in ’12, ’14, ’15 and ’16 and a last-second quarterfinal loss to Derby last year. These two teams have matched up twice with Free State winning in the regular season in ’14 and ’15. Last week, Free State defeated Haysville Campus, 51-27. Jax Dineen had 21 carries for 164 yards and two scores. Tyler Bowden delivered 97 rushing yards with a TD, as Free State had 41 carries for 317 yards. The Firebirds enjoyed another big special teams game with an early blocked punt for a safety, though did fumble a kickoff return. Keenan Garber picked off two passes and had a 55-yard pick-six. Free State limited the Colts to 4.1 yards per pass attempt. Malik Berry, injured for part of the year, completed 9 of 16 passes for 133 yards and three passing touchdowns but had two interceptions. Free State led 30-14 at halftime. Shane Skwarlo has led the offensive line and helped lead the group as junior Turner Corcoran, a high-level Division I recruit, has missed the last couple weeks with a knee injury. Overall, Berry has completed 64 of 117 passes for 1,100 yards and 20 scores. Garber has 32 catches for 755 yards and 16 scores. Dineen has 1,279 rushing yards and 15 TDs. For Manhattan, Kevontae McDonald has 1,345 rushing yards with 24 scores. Tyreek Tolliver, Robert Houston and David Hernandez have combined for 31 tackles for loss. Manhattan defeated Wichita West, 36-25, last week. McDonald led the Indians ground game with 133 yards and three scores. Sophomore quarterback Dane Aschenbrenner also passed for 120 yards and a score to provide balance. This is the matchup we expected to decide the eastern half of Class 5A all season. These two Eastern Kansas League rivals will meet for the second time with St. Thomas Aquinas winning 24-13 back in Week 4. In that game, the Saints led 10-7 at halftime before sophomore Tyron “Tank” Young broke free for a 92-yard touchdown run in the third quarter. Mill Valley would pull within 17-13 in the fourth quarter on two Chris Tennant field goals, but Young’s 70-yard run would put the game away for the Saints. Young has had an incredible sophomore season in leading the Saint offense that averages 404 yards per game on the ground behind a dominant offensive line. Tank has carried 160 times for 1,607 yards and 20 touchdowns. Cameron Jackson is second on the team with 469 yards rushing after an all-state season in 2017 in which he rushed for 1,414 yards and 19 touchdowns. Quarterback Tate Raboin has kept opponents honest by passing for 733 yards and 10 touchdowns. The Aquinas defense has been exceptional behind linebackers Zach Goodeyon (61 tackles) and Bo Meisenheimer (46.5 stops), while Javier Derritt has 34 tackles and 10 tackles for loss. On the other sideline, Mill Valley has won five consecutive games since a three-game losing streak to Bishop Miege, Aquinas, and Blue Valley North. Last week, the Jaguars scored twice in the third quarter to pull away from St. James Academy as part of a 24-7 win. Junior running back Tyler Green rushed for 142 yards and two touchdowns, while Jordan Preston passed for 67 yards and a score and added 53 yards on the ground. For the season, Green has led the Jaguars with 698 rushing yards and nine scores, while senior Cameron Young has battled through injuries to add 422 yards and seven touchdowns. Preston has passed for 1,744 yards and 12 touchdowns with senior Logan Talley having another strong season with 59 receptions for 734 yards and three scores. In the first meeting, Mill Valley was unable to establish any success on the ground against the Aquinas defense. The Jaguars finished with minues-9 rushing yards on 24 attempts, and relied on Preston who passed for 235 yards and a touchdown. Mill Valley will likely have to find some balance on offense in order to go to Aquinas and escape with a win over the top-ranked Saints. It’s been quite an inaugural season for Olathe West. Just a few weeks after picking up the first win in school history, the Owls find themselves in the state quarterfinals against De Soto. Meanwhile, De Soto has reloaded after replacing the bulk of its starters from last season’s state semifinal run, to have a shot to get back to that same round again this year. After closing out the regular season with a loss at Pittsburg, De Soto won its first two playoff games over KC Turner and Shawnee Heights. The Wildcats scored three touchdowns in the fourth quarter last week to pull away from Shawnee Heights in the 38-17 victory. Sophomore quarterback Jackson Miller delivered his biggest passing performance of the season in throwing for 157 yards and a touchdown. Keegan Sturdy caught four passes for 175 yards and two touchdowns, with one coming from Aaron Mackay. Sturdy also rushed for a touchdown in the game. Sturdy, who recently became De Soto’s all-time leading receiver, has receptions for 773 yards and 10 touchdowns this season. Miller has passed for 1,053 yards and 14 touchdowns on the season, while adding 545 rushing yards and 10 more scores. Connor Brady and Tyson Priddy have also been key contributors to the Wildcat running game with 512 and 460 yards, respectively. Meanwhile, much of Olathe West’s success has relied on the arm of senior quarterback Zac Krause. Krause has passed for 1,742 yards and 16 touchdowns this season after last week’ 251-yard, two-touchdown performance in the Owls’ 49-15 win over KC Schlagle. Krause’s top receiving targets have been juniors Connor Delong and Caden Barnard. Delong leads the team with 42 catches for 627 yards and six touchdowns, while Barnard has 36 receptions for 506 yards and two scores. Gavan McDaniel leads the Owls on the ground with 927 yards and eight touchdowns, and has the opportunity to, obviously, become the first 1,000-yard back in school history this week. This is a rematch from a Week 1 classic where Wichita Northwest defeated Bishop Carroll, 23-22, on a last-second field goal. Two years ago, the teams played another great game in Week 1 and Carroll won, 40-35, en route to the City League and Class 5A title. Northwest has averaged 50 points a game in each of the last two seasons and again leads 5A by a massive margin with 54.7 points a contest. Northwest allowed 21.9 a contest last fall and 20.5 this season. Bishop Carroll has overcome significant injuries, especially at the quarterback position and to tight end Clay Cundiff, a Wisconsin commit. Carroll has an average score of 36-21 and also lost to No. 1 Derby. In the regular season, Carroll came back to win at Great Bend and beat Salina Central last week, though standout running back Taylon Peters did not play. Northwest has its stable of elite playmakers with quarterback Reagan Jones, running back Breece Hall and defensive players Marcus Hicks and Josh Carter. Northwest averages 357 rushing yards a game and 202 passing yards a game. Jones has completed 97 of 161 passes for 1,947 yards with a 27/3 TD/INT ratio. Hall has 147 carries for 1,499 yards and 19 rushing scores with eight receiving TDs. Jones and Roy Johnson have 26 rushing scores. In the first meeting, Carroll limited Northwest to 196 rushing yards and 4.3 yards per carry and just 139 passing yards on 23 attempts. Northwest had 335 total yards in the victory, by far its lowest total of the year. This game is generally pretty close, but Northwest has more top-ended talent than Carroll and has a strong chance to move into the sub-state title game for the second straight year. This is the first time the two schools have played since at least 1989, according to Kansas Football History. A win would match Maize’s best finish ever, a 1990 semifinal showing. Great Bend has three semifinal finishes with a 2006 runner-up. Maize ranks first in Class 5A in scoring defense with just 85 points allowed. The Eagles have scored 393 points, third-best in Class 5A. Great Bend has enjoyed a three-win improvement after a Class 5A semifinal trip two years ago. Maize quarterback Caleb Grill, a South Dakota State basketball signee, has enjoyed a great season throwing and punting the ball. He threw for 277 yards and three passing yards in a 35-0 win versus rival Maize South. It marked the first time Maize had beaten Maize South in school history. Maize’s defense has excelled in several areas, especially pass defense and third/fourth down. The Eagles, paced by senior defensive end Noah Stanton, has permitted just 4.6 yards per pass attempt. Teams have completed just 49 percent of passes for 93.2 yards per game. Maize has allowed 142 rushing yards and 3.8 yards a carry. Teams have converted 23 percent of third downs and 27 percent of fourth downs. Great Bend has outscored teams, 332-170, against the No. 13 SOS, a little better than Maize’s No. 17 SOS. The Panthers have enjoyed great balance on offense with 192 rushing yards and 197 passing yards a game. Senior quarterback Koy Brack has completed 119 of 208 passes for 1,891 yards with a 20/10 TD/INT ratio. Junior Gage Fritz has 158 carries for 1,108 yards and eight rushing TDs. Brack has 263 rushing yards with 12 rushing TDs. Junior Alex Schremmer has a breakout season with 50 catches for 1,015 yards and 13 scores. Junior Dalton Miller has played well in all three phases with 997 all-purpose yards and 83 tackles.